Reason: for believing intelligence is fixed and fee-paying schools are the only hope for bright children. There’s a lot to admire about Boris Johnson. The brilliant turn of phrase, the genuinely funny jokes, the relentless elan. He’s like a cross between Stephen Fry – luxuriating in their love of language and culture – and Peter Oborne – by turns, both spot-on and breathtakingly, inconsistently wrong-headed. He’s previously been a Liberal Hero for his pro-immigration stance. He remains, at least in current Conservative Party terms of trade, a pro-European. And he used his Margaret Thatcher Lecture this week to urge Whitehall to devolve power back to local areas, and “give the politicians an incentive to go for policies that promote growth”. If all Boris were saying here is that some people are born with greater aptitude than others, I don’t think it would be controversial. Those of us lucky enough to be born in wealthy countries who’ve benefited from a good education are at a natural advantage in life – if we didn’t think that we wouldn’t want it for others, and we do. 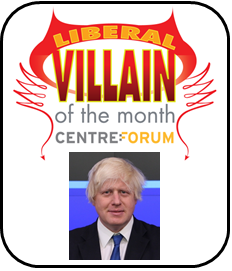 But, through his fuzzily colourful metaphor, Boris implies we are all made high and lowly, and that God (or Mammon) has ordered our estate: “I am afraid that violent economic centrifuge is operating on human beings who are already very far from equal in raw ability, if not spiritual worth”. It’s a view which ignores the growing evidence that our intelligence is not fixed, but malleable, that through learning and practice even those whose raw ability is sub-standard have the potential to become better cornflakes. That in itself points to the importance of education. But here again Boris comes unstuck, lamenting his heroine’s scything of socially divisive grammar schools (while carefully avoiding promising to bring them back) and lauding the assisted places scheme which plucks a lucky few of the top cornflakes at age 11 into fee-paying schools. In other words, fee-paying schools do well in the league tables because they select cornflakes from the top of the pack, rather than any of the ones which a bit crushed and dusty at the bottom of the pack. Shaking the pack once, at age 11, and scooping out the top layer is no way to make the most of your cornflakes. The answer is to support (and challenge) state schools to stretch all their pupils, including – yes, absolutely – their most able. It’s always hard to know with Boris how much is calculated with an eye on the Tory leadership and how much he actually believes. Sometimes, as with immigration, he shows a commendable willingness to take on popular opinion, and confront it with hard truths. That’s when he’s heroic. Other times, as with grammar schools, he shows himself stuck in a crusted rut of out-dated Tory thinking, indulging in nostalgia for a golden age that never was. And that’s when he’s a villain.